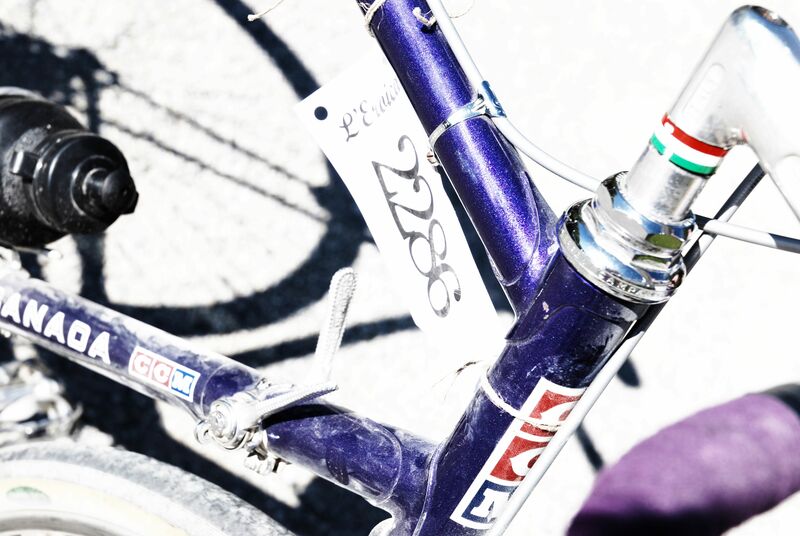 This Sunday, October 6 will be the 17th Edition of L’Eroica ( the “Heroic”), held in Gaiole, Chianti Italy. I wish I could be there this year but I had the great fortune to participate in 2011 where I was recognized in article by VeloNews stringer. It is an absolutely amazing celebration of all things Italian, cycling and much more; a must do “once in your life” event . Several of you have asked me to write a bit more of my experience there and any advise I could share, so here it goes. 1500 Italian males born between January 1, 1954 and December 31, 1997 (under 60) are selected through a lottery. 1000 foreigners under 60 years of age are selected through a lottery enter the draw by registering online on the website www.eroica.it beginning January 21 to March 3. Italians or foreigners males born before 31 December 1953 (over 60) and women regardless of age and number, are unlimited and can register online February 1 to June 20. There are two majors courses, 35/75km and 135/205km. I road the 135km course and can’t comment on the 35/75km course directly as while they start/finish in Gaola, they run on different roads. 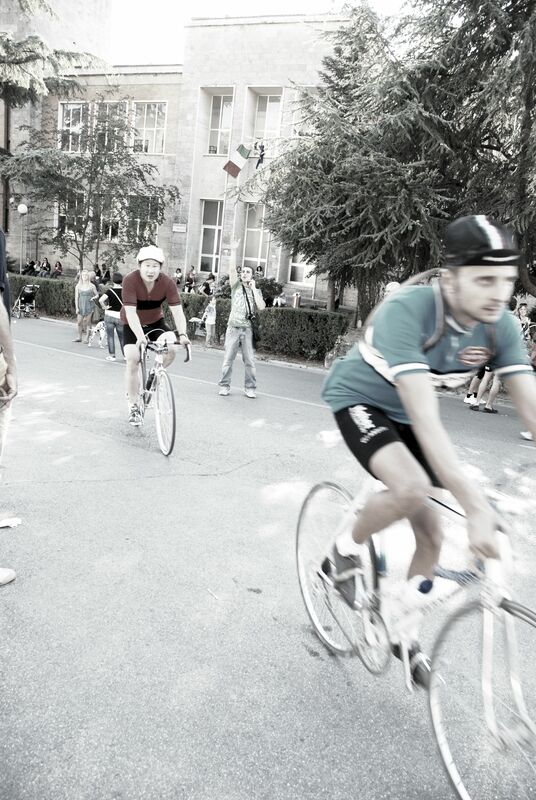 The L’Eroica started as an event to preserve and celebrate Italian cycling traditions. 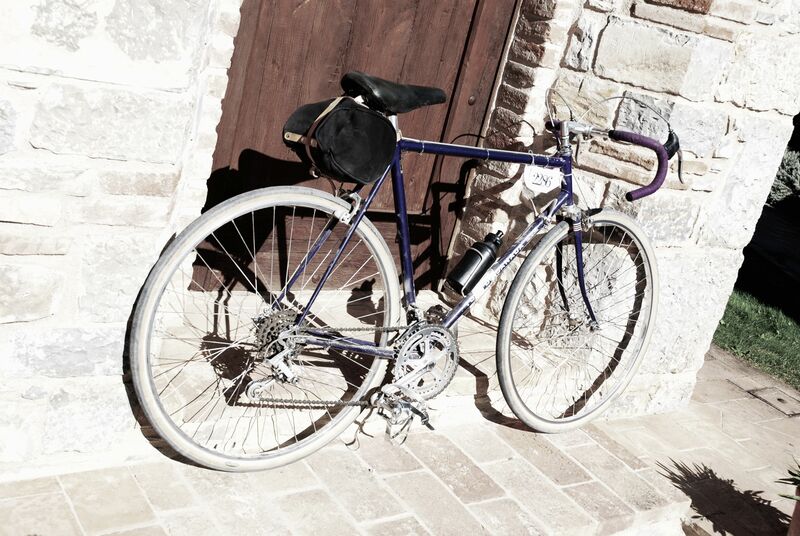 Italy was once criss-crossed with white gravel road, the strade bianche or sterrati but they are disappearing with modernization and are being rapidly paved over. In Chianti the remaining sections are now protected as heritage sites and the course are a mix of paved highway and strade bianche. The general consensus from finishers is that the 135/205 km ride as a combination of distance, heat, descents on gravel, extreme grades of the climbs made the experience was much harder than most expected. There are some great photos here of roads. At about the 55 km mark the route splits into the 135 and 205 km loops. I noticed a LOT of Italians stopping, discussing and then choosing the 135 km. Very few went the long route. Fred and I decided they knew something we did not and that discretion would the better part of valour. We also took the 135 km route. We were able to enjoy the wonderful food and drink at the rest stops leisurely instead of filling our pockets and rushing off. We got to finish in time to take in the festivities still in full swing mid-afternoon in town. After dinner we saw all but the fastest and fittest 205 km riders straggle in through the dark, early evening. Some were clearly suffering and were being met not by streets lined with cheering supporters but by people packing and leaving. We knew we had made right choice in hindsight. I’m still tempted to ride the 205 km but if I do I will make sure I get to town by 4 AM for an early start so I can be in by 4 PM to take it all in! There is a lot of sections are REALLY steep so you can’t bring too low gearing. 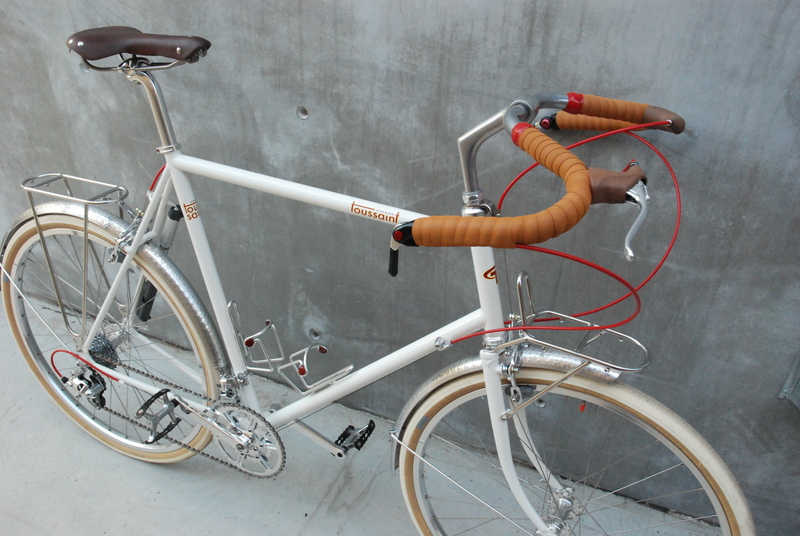 While I chatted to a Brit who rode/walked a fixed gear track bike with no brakes (!) and saw a fair number of straight blocks, I rode with 42X32 low gear with a Campy Rally that I put on my bike for the event. I was really glad that I did as I used my lowest gear a lot and finished the ride pleasantly tired and not thrashed as I witnessed with some of the riders who came in later. A 30X32 would have been even better for my battered knees though. What goes up goes down very quickly in Chianti and the downhill sections can REALLY be challenging on vintage brakes and tires. I witnessed a few near misses and there were several crashes as riders with dry old brake pads and squishy calipers lost control on narrow, soft gravel sections crowded with other riders. I put new modern pads on my Universal 68’s which improved the braking from terrible to merely crappy. My arms got quite sore at spots trying to slow my bulk to take the series of hairpins on rutted gravel at 15% grade while shoulder to shoulder with other riders trying to do the same. Next time I going to fit some good centre-pulls like Mafac or Weinmann with modern pads. As well the strade bianche was quite rutted and washboarded in sections so for comfort and control slack geometry is be recommended. used have and are packing an extra 5, 10 or 50 pounds to punish our poor wheels on pot-holed gravel.Good lights are a must and they need to last for 2-3 hours. There is at least an hour riding in the dark in the morning and about an 1-2 hours in the evening if you do the 205km loop. The first 10-12% downhill at Brolio is packed with nervous riders, very sketchy and hard to judge in the early morning light! You should bring spares and tools. 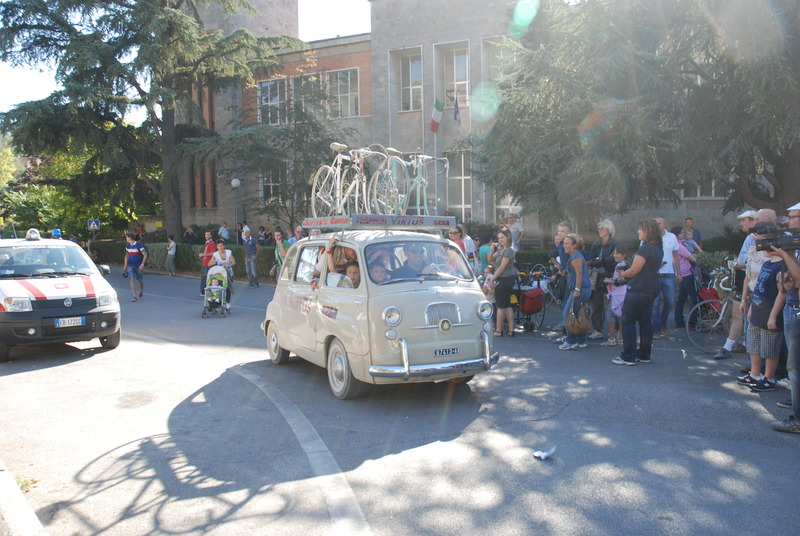 I did not see any support on the road except for groups that had a team car (amazing vintage Fiat Cinquecento, 600 Multiplas and 2CV’s as well the modern rentals) as the road are open to traffic in most parts. Make sure you get to Gaiole the day before to register and take it all in. The town is humming with activities and there is great bike jumble with all kinds of vendors selling and trading parts, clothing and memorabilia. You can get your bike officially photographed Saturday at the town hall for their archives. If you are going on the long loop, get to the start early at least 5:00 AM to miss the big crowds. It took us at least half an hour to find the start in the dark and minimal signage, signed in and out on the course. You do not need to carry much food if any as there is pastries, fresh fruit, vino, stew and bread in abundance at the rest stops. Make sure you stay hydrated and have two bottles for the mid-portion stretch before Monte Sante Marie which was blazingly hot in the afternoon for us with no shade and no water stops for what felt like an eternity. There several DNF’s lying under trees in the early afternoon suffering from too much food, vino and heat prostration. There is very limited/no support if you have a mechanical and be warned that timely medical support may be not be available if you crash. The town is one big festival all day Sunday with many of the 35 km riders dressed to the nine in turn of the century costumes parading and hamming up for photos. Celebrities were spotted in town with Moser, Saronni and other Italian luminaries presiding over ceremonies and ribbon cuttings while the rest of us were grinding up and down the hills. It’s been a busy summer and I am finally getting around to posting some pictures of some customer builds. I like to call this one the “Speedster”. 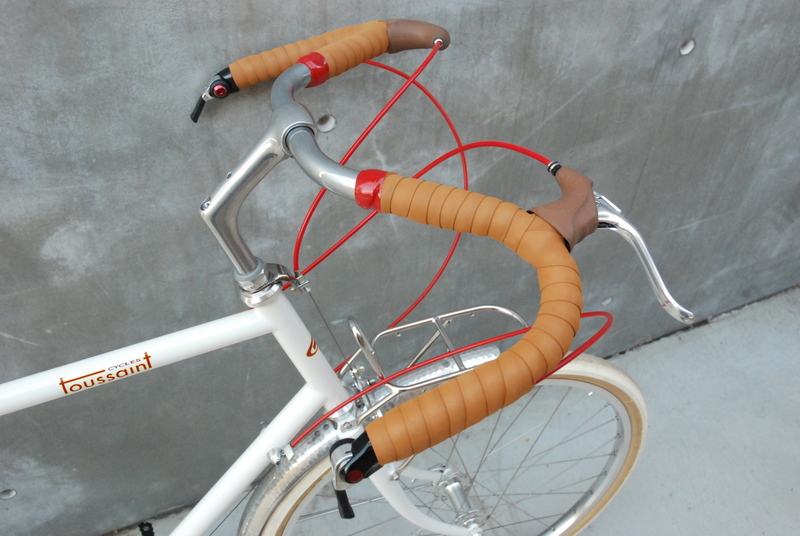 A 54cm Velo Routier with Nitto moustache bars and white Soyo NJS grips and no racks. The owner agonized whether to leave fenders off, I’m glad he left them on. 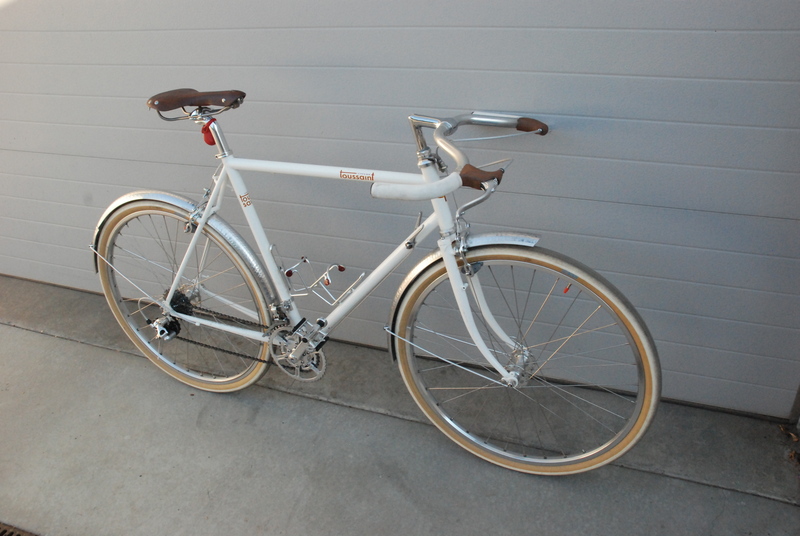 This Velo Routier build was for a 6’5″ customer for commuting. It was a bit a rush job as he wanted to get most of the short Canadian summer but I managed to locate a supply of steel mustache bars for him ( I have 2 left) as he is solid 240 lbs and want a stiffer set of bars. 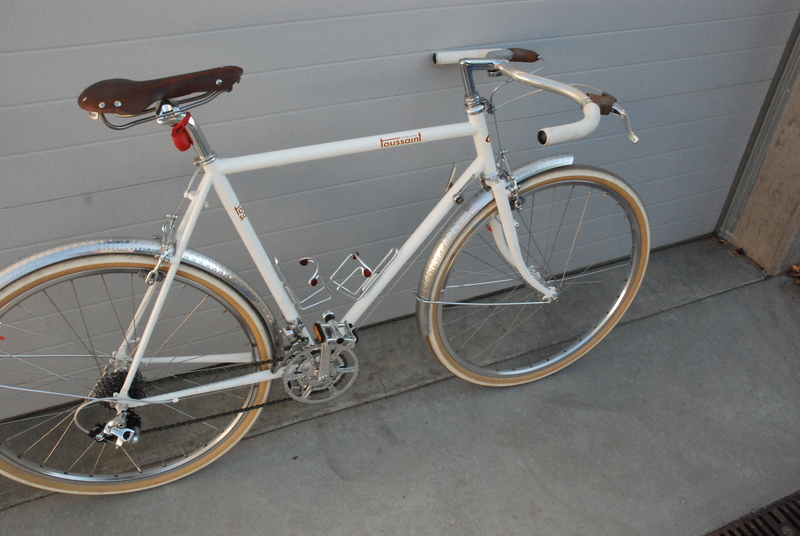 We installed microSHIFT 10 speed bar ends BS-T10 shifters for him and some large pedals for size 13 feet.